Luke was the author of Acts. The only historical source we know Luke used is Josephus, and Josephus didn’t mention Jesus at all. Luke also used Mark, Mathew, the epistles, and the Kings narrative from the Old Testament, basing Jesus and Paul on Elijah and Elisha. Like everyone else who wrote in Greek at the time, Luke would have been familiar with Homer. Carrier quotes Dennis MacDonald regarding Luke’s imitation of Homer: “the shipwrecks of Odysseus and Paul share nautical images and vocabulary, the appearance of a goddess or angel assuring safety, the riding of planks, the arrival of the hero on an island among hospitable strangers, the mistaking of the hero as a god, and the sending of him on his way [in a new ship].” There are also numerous other examples of Homeric influence. Luke uses other literary sources as well. The prison breaks in Acts are similar to the prison breaks in the Bacchae of Euripides. Ezekiel, Daniel, and other Old Testament books are also used. Acts also uses Paul. Acts 15:7-11 puts Paul’s words from Galatians 2:14-21 into Peter’s mouth, which is the opposite of what Paul said happened. Acts feels free to contradict Paul in order to present a particular idea for how the church began. The story of Paul in Acts parallels the story of Jesus found in Luke. Acts is also based on the book of Tobit in which blindness falls like scales from someone’s eyes involving a man named Ananias (or the son of Ananias) traveling on a road in order to deliver a letter with a divine being in disguise. Acts is also similar to popular adventure novels of the time. Acts shares far more in common with ancient novels than ancient histories. Acts is pretty much entirely a literary fabrication, just as fictional as all the non-canonical Acts. If there is any genuine history in it, it would be impossible for us to tell. Strangely, all the people associated with a historical Jesus disappear from Acts early on. Pontius Pilate, Joseph of Arimathea, Simon of Cyrene and his sons, Martha, Lazarus, Nicodemus, Mary Magdalene, and the entire family of Jesus all vanish from the record after the beginning of Acts. James, the brother of Jesus, came to be considered a leader in the church in later Christian legend, but doesn’t get mentioned in Acts. This is very strange if Acts is meant to be history. Carrier also points out that Paul’s trial accounts in Acts (unlike his speeches and sermons) have no knowledge of a historical Jesus, so it’s possible these came from another source. Overall, Acts is more likely on the theory of mythicism than historicism. Eugnostos the Blessed is a Jewish document concerning the first born Son of God called the Savior and Son of Man. 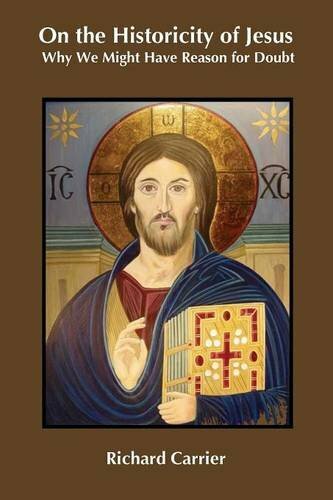 The Wisdom of Jesus Christ quotes from and expands upon Eugnostos and passes the sayings off as those of Jesus. Since we know from this example that Christians felt free to attribute sayings from other people to Jesus, the gospel writers could have done the same thing. We already know many sayings of Jesus were taken from scriptures, so it’s not a leap to suppose some of Jesus’s sayings were taken from scriptures that have now been lost. There’s a long standing debate among biblical scholars regarding the genre of the gospels, but it really doesn’t matter. Any genre, including history and ancient biography, could contain myth. See Plutarch’s Life of Romulus for example. What matters is that the Gospels are not researched histories, even by the lax standards of antiquity. They don’t name their sources. They don’t discuss methods or the possibility of information being incorrect. They don’t discuss the existence of alternative accounts. They don’t express amazement at incredible events. They don’t explain why they changed their sources or even acknowledge that they did. They also don’t explain who they are or why they’re qualified to write history. Greek students at the time, such as the gospel writers, were taught to invent narratives about famous persons and to build a symbolic message out of proverbs. The Gospels are similar to such exercises delineated in ancient rhetorical handbooks. The Gospels are literary constructs. Mathew based his version of Jesus on Moses, used Daniel to rewrite the empty tomb narrative, etc. Mark created the crucifixion narrative out of Psalm 22. He made the disciples of Jesus be fisherman in order to make Jesus into a new Odysseus. Nearly the entire Gospel narrative is derived from scripture. Most biblical scholars acknowledge this, but they still think it’s possible to extract historical kernels from the gospel fiction using tools such as the Criterion of Embarrassment. However, all such tools fail. For example, most biblical scholars think Jesus was born in Nazareth because they can’t think of any other reason why Jesus would be called a Nazorian. However, there are reasons for this such as fulfilling the prophecy cited in Mathew 2:23. Also, according to Acts 24:5, the first Christians were called Nazorians. Jesus didn’t have to be from a town called Nazareth. Likewise, the argument that a source is historical because it appears to derive from Aramaic doesn’t make sense. Aramaic was spoken by millions of people. Even if you could prove that a particular saying went back to Aramaic, it doesn’t prove that it was historical. Most of the criteria biblical scholars use to extract history from the gospels aren’t valid.